The search for a missing Russian cargo ship was "developing quite dramatically" Friday, according to Russia’s ambassador to NATO. But exactly what was developing was not made clear. Ambassador Dmitry Rogozin spoke on Radio Echo of Moscow amid reports of progress in the search for the Arctic Sea, a cargo ship whose Russian crew was last heard from after a reported hijacking two weeks ago. Asked about reports that the ship had been located in the Atlantic Ocean, the ambassador said, “We do not disclose such information, at least until there are necessary conditions for that.” He declined to elaborate. The Russian military has been searching for days for the Arctic Sea. The 15-member crew’s last known communication with authorities came a few days after they reported that masked gunmen posing as drug-enforcement agents boarded their ship in the waters off Sweden. Reports in the state-run Russian news agency RIA Novosti said Friday that the ship was near Cape Verde, an island nation a few hundred miles from the coast of western Africa. Those reports cited comments that Russia’s ambassador to Cape Verde, Alexander Karpushin, made to the Russian News Agency, which runs a radio station and wire service. The ambassador told CNN, however, that information about the ship being near Cape Verde was “dated” and “wasn’t … official information from the very beginning.” The U.S. military had a report this week that the Arctic Sea was seen a few hundred miles from Cape Verde, two military sources said, but the United States had no independent verification of those reports. The U.S. military is not involved in the search. The Arctic Sea, which sails under a Maltese flag, was carrying a 6,500-ton cargo of timber from Finland to Algeria when it reported trouble on July 24. Its crew told authorities that eight to 12 masked people boarded the vessel about 3 a.m. that day and bound and beat the crew, according to a statement from the Maltese Maritime Authority. “During [the attackers’] stay onboard, the members of the crew were allegedly assaulted, tied, gagged and blindfolded, and some of them were seriously injured,” the maritime authority said in a written statement. 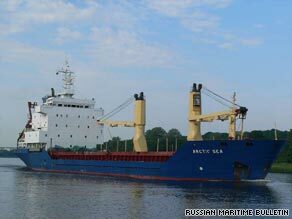 The ship was last heard from July 31, when crew members spoke to Swedish police. “All of our staff in our company are working very hard to get back in contact with the ship,” said Victor Matveev, director of Solchart Management AB, the company that owns Arctic Sea. “It has been a really hard time for us.” On Wednesday, Russia said naval vessels authorized to use force were hunting the Arctic Sea with the aid of “space-based” detection systems. The Maltese Maritime Authority said Wednesday that the ship appeared to have headed into the Atlantic Ocean, but mystery surrounded the ship’s movements and the fate of its crew. Russia’s Defense Ministry said on its Web site that Black Sea Fleet patrol ship Ladny was heading the search operation and had passed through the Strait of Gibraltar into the Atlantic. Russian President Dmitry Medvedev instructed Defense Minister Anatoly Serdyukov to “take all necessary measures to locate, monitor and, if necessary, to free the missing vessel,” a statement issued by the president’s office said. During the reported hijack, the vessel’s radar and satellite systems were off-line for two hours, during which it was witnessed performing “extreme maneuvers,” said Maria Lonegard, a spokeswoman for the Swedish police. There were no witnesses who saw the black rubber boat the pirates were reported to have used, according to Lonegard. The “ship managers” reported the incident to police in Helsinki, Finland, on July 28, the Maltese Maritime Authority said. That same day, the ship made radio contact with the British Maritime and Coastguard Agency as it passed through the English Channel, but the crew reported nothing untoward, said the agency’s Mark Clark. Three days later, on July 31, Swedish police reached the ship by phone and spoke with someone they believe to be the captain, Lonegard said. It was the last known communication with the vessel, which was believed to be off the coast of France at that time. Matveev said he spoke to people on the ship July 30, and “all looked normal, like normal day-to-day business.” But he said he was unable to raise the ship August 1. The ship did not arrive in North Africa as scheduled August 4. Experts say maritime crime is rare in heavily policed European waters and more common around areas, such as Somalia, where governments have little or no control over their ports. “Attacks on ships are extremely rare; basically, they don’t happen,” said Jeremy Harrison of the British Chamber of Shipping.